A counsellor’s first task is to consider what basic information is required for administrative purposes, for example, name, address, telephone number (home and work), referral source. In addition, many counsellors take a client’s General Practitioner’s details as part of the initial administrative recording procedure. This latter point may be totally redundant if you are a careers counsellor offering a one-off two hour session regarding retraining or job search. However, if the counsellor is working with clients within a more typical counselling framework this information could prove crucial in terms of protecting clients and those around them from harm. Counsellors may leave themselves open for claims of negligence if they are not seen to be taking adequate precautions in terms of client safety. A counsellor might find it hard to justify why he/she did not record a client’s G.P. details if called to account in a court of law as this information could be considered a basic professional requirement. In many instances taking the client’s date of birth proves useful if the counsellor needs to write to an outside source such as a GP or a psychiatrist. It is usual practice to give the client’s full name, address and date of birth as this leaves less room for error in securing the correct patient notes.It would also be wise to mark the envelope “Private and Confidential” as a way of demonstrating commitment to client confidentiality. 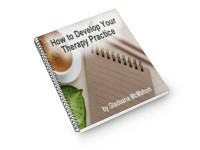 Please email the ‘How to develop your counselling practice information’.